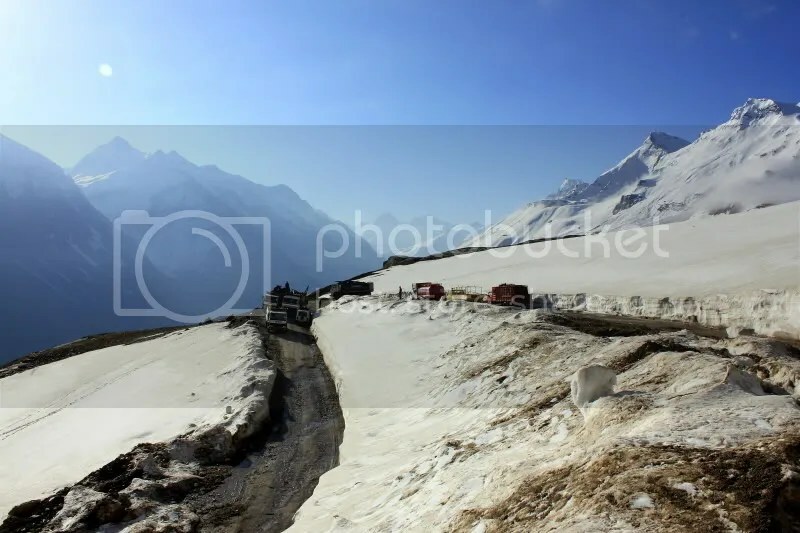 Manali-Kaza | high road to.. Arrived in Manali yesterday , with a half meter of snow being dumped on the Rothang La during my bus ride from Delhi. News talk of a number of vehicles ( figures strating from sixty ) being trapped in the pass , and snow cutters now working their way up. Had some fresh snow thrown at me from Gulaba , the highest open point this morning ( i.e. 3000 meters ) . Also mentioned in the news : Srinagar-Leh also closing the same day (!) , snowfall in Kalpa (13 cm ) and Keylong ( 18 cm) , Saach Pass ( more than a meter ) and over the Kunzum La , closing the Manali-Kaza route on a second point. UPDATE : BRO talks of having the road cleared within two days , according to a official quoted by Himvani. UPDATE , OCTOBER 26th : Srinagar-Leh has been posted as open today , and I’m heading for Leh tomorrow morning from Manali. More reports of bikers making it to Leh from Manali , and from Kaza ( i.e. the Kunzum la is open. ) Both routes are “scary” , with high water levels. Main hurdle is a six to seven kilometer stretch with slush , up to three feet , on northern side of the Baralacha La . Weather forecast talks of rain the five coming days in Lahaul , and four out of five in Ladakh. 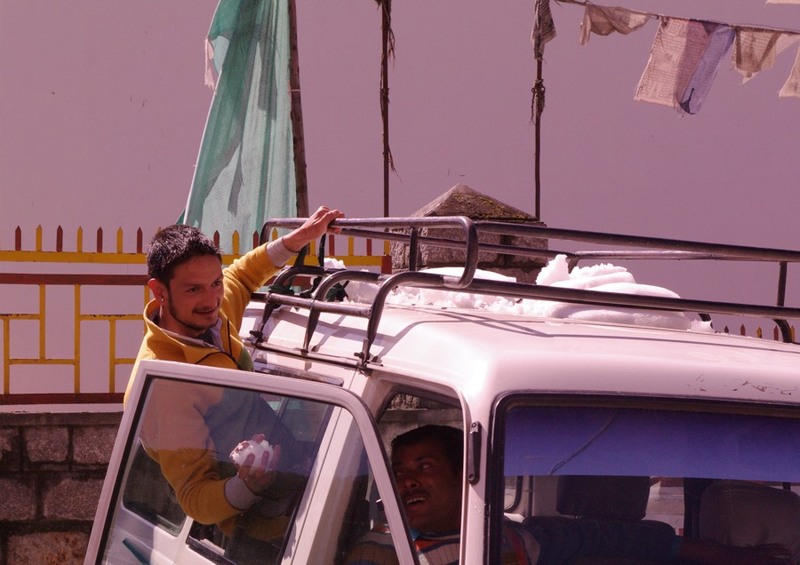 American cyclist Jewel Edward seems to be the first casualty of the June misweather in Lahaul . Apparently he became separated from the rest of the group in what is described as snowstorm , and died near Chattru after having crossed the Kunzum La pass. Along the same route students and teachers were finally airlifted out from Batal , where they had been forced to take shelter more than a week ago. Evacs were done to Koksar – Rothang to Keylong is open. Later in the week 1300 sheep and goats were killed in one fell swoop by a massive avalanche near the Baralacha La , but the shepherders managed to stay out of harms way. Higher up in the pass a number of truck drivers are more or less contentedly munching away at their provisions , after being stranded about a week. Weather forecasts promises a final day of rain & snow on the 18th in Lahaul & Ladakh, to be followed by two clear sunny days . 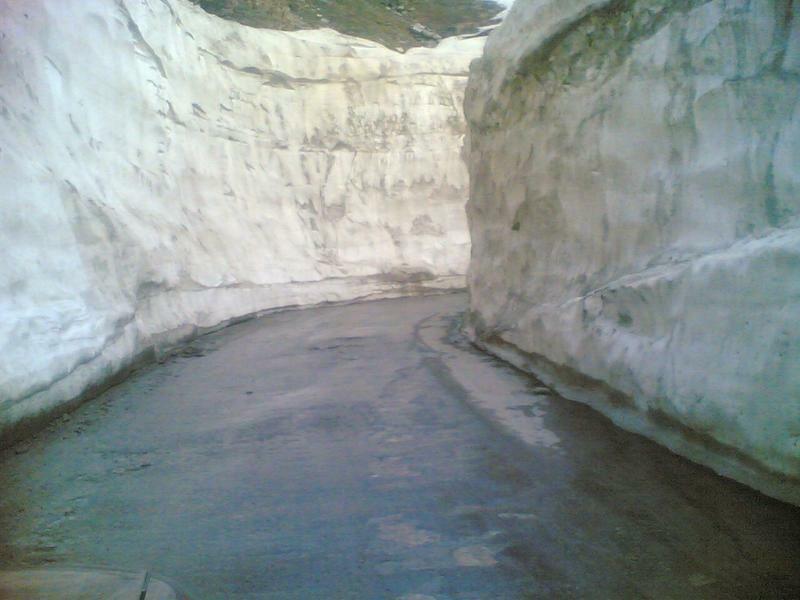 Saach Pass opened on the , after being closed since December. UPDATE , JUNE 20TH : Mixed weather forecast from Leh , Lahaul forecast says rain four out of the five coming days. There is a rumor of the road being open for light vehicles : third hand report from a single poster on a forum , no vehicles seen coming in to either Manali or Leh … and now , a couple of hours later there is confirmation from Manali : first bikers from Leh have arrived. IndiaMike poster uttam became one of the first bikers crossing the Rothang La on June 12th , coming from Spiti , and reports that the road at Koksar was washed away . Lots of more great photos in his gallery . 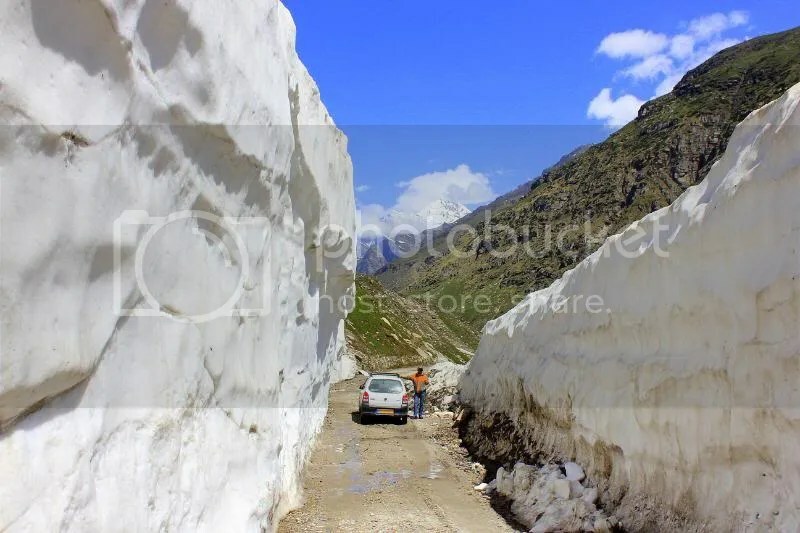 Srinagar-Leh road has received a lot of rain in lower elevations , turning in to snow high up ( five centimeters of snow in Sonmarg) : road has been closed again. 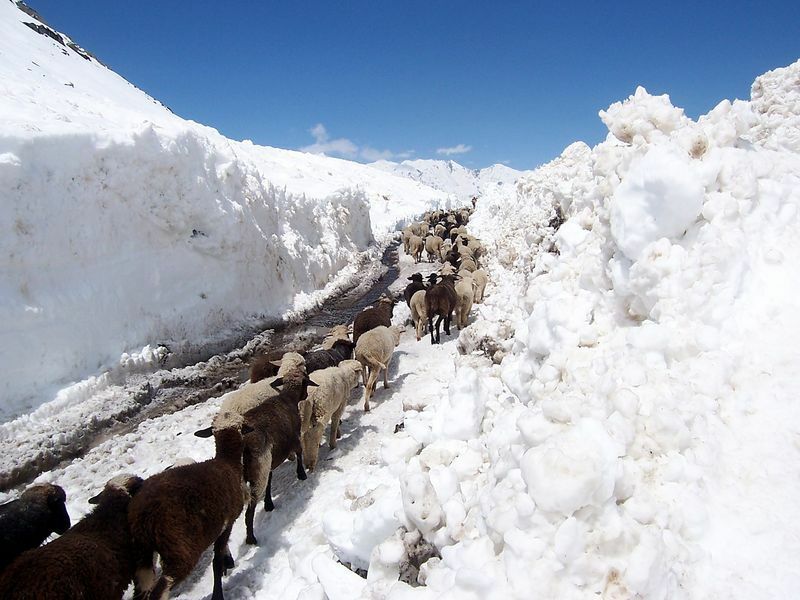 Manali-leh is still out after Keylong , which just has received five centimeters of snow. Manali-Kaza is out after snowfall and slides after Grampho. Manali-Leh Opening Within a Week ? A Himvani story today details the road opening between Manali and Kaza : the Kunzum La has been cleared before the opening of the Manali-Leh highway, contrary to expectations. .
BRO had plans for a Manali-Leh opening around the 23rd , but that was before the renewed snowfall on the 19th.The new guesstimate is within a week. Rothang remained open thru this , and the road to Keylong. Said to remain at the moment is a three kilometer stretch , unspecified where. North side of the Rothang La , by Avinash Siddhu , on the 17th – before renewed snowfall hit the Rothang , turning in to rain lower down. Baralacha La still out. And a promising feel to the eastward road from Gramphu towards the Kunzum La , again , before the last snow. A number of reports of snowfall from Chitkul , Baralacha La and even Kaza. At the Chang La pass an avalanche killed a tourist , a local from Leh later also died from his injuries while the army managed to rescue 73 others trapped by the avalanche which laid two meters of snow masses over the road. Srinagar-Leh road also out , from slides ,not avalanches.